The Arbanasi dialect is a dialect of Gheg Albanian that is spoken in long-standing diaspora communities of Albanians in Croatia. Its speakers originated from the region around Bar, Montenegro (Albanian: Tivari) as well as the nearby Kraja region, and moved to Croatia in the early 18th century. In the former, Albanian is no longer spoken by large numbers of inhabitants. It is notable for a number of divergent developments as well as preservations of certain archaic features of Medieval Gheg Albanian. Slavic Croatian influences are present, as are Romance influences from Italian and Venetian. The dialect may also be called the "Dalmatian dialect" of Albanian in some older publications. 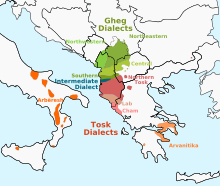 Unlike most Albanian dialects, both Tosk and Gheg, which have two r phonemes, an alveolar tap (/ɾ/ and an alveolar trill (/r/, Arbanasi only has one, the alveolar tap (/ɾ/). All instances that were originally rr (/r/) have merged into 'r' /ɾ/. This is the reverse from Croatian, Italian and Venetian, all three of which have a trill but no tap. Albanian palatals q and gj (/c/ and /ɟ/ respectively) have merged into "hard" affricates ç and xh (/t͡ʃ/ and /d͡ʒ/), as occurs in many Gheg dialects. Sporadic elimination of Albanian interdental fricatives th (/θ/) and dh (/ð/) (Albanian gjithë> Arbanasi gji), or shifting them respectively to /s/ and /l/. These sounds are absent in Croatian and Italian, though not in Venetian. A /s/ to /θ/ shift sporadically as well: e thoj for Standard Albanian e saj. Gheg nasal vowels are denasalized. Deletion (apocope) of /h/ wherever it occurs. Note that Italian and Venetian, like most Romance languages, lack the sound. Word-final consonants are sporadically lost in Arbanasi. Non-standard imperatives : "art!" for the imperative of vij ("to come", likely derived from the root of the past tense erdh- and/or the past participle ardhur, while the present tense is a partial borrowing from ancient Latin). In Standard Albanian, this would be "eja!" Romance influence is seen in the use of constructions of bëj ‘do’ + infinitive. The infinitive is constructed in the standard Gheg fashion using me ("with"). Arbanasi contains a number of words borrowed directly from Venetian : buti, shtrancata, shola, shoto (cf. Italian sotto) etc. Loans from Croatian penetrate into the functional vocabulary: da (Croatian for 'that') used for that instead of Albanian që (which itself is thought to be a Latin loan), bash "just" (instead of Albanian vetëm "only"). Other loans from Croatian: kral ("king", Croatian: kralj; Standard Albanian: mbret or Gheg regj, both from Latin), milo ("merciful", semantic shift from Croatian mila "dear")., quditum "astonished"
Loans from Italian rather than Venetian are also present: for example, apena ("as soon as") from Italian appena, inveqe ("on the contrary") from Italian invece . Loans from Italian via Croatian : kantat "sung" (Standard Albanian: këndoj, itself a Latin loan). Arbanasi speakers have assimilated a large number of former Chakavian Croatian speakers who settled among them historically. Arbanasi speakers are usually bilingual in Croatian, and historically they were trilingual, also speaking the Venetian language. ^ Hammarström, Harald; Forkel, Robert; Haspelmath, Martin, eds. (2017). "Arbanasi". Glottolog 3.0. Jena, Germany: Max Planck Institute for the Science of Human History. ^ Lorger, Srećko (2004). "Bajli - čakavski Arbanasi" (in Croatian). Mozaik; Slobodna Dalmacija. ^ Stagličić, Ivan; Barančić, Maximilijana (2011). "Arbanasi su se prvo doselili u Zemunik" (in Croatian). Donat; Zadarski list.